← Lack of Scrum Success stories a Growing Concern? 2) Make sure to use post its. Post its are still seen as very cool. Bright colored ones make you look important and organized when you stick them on the big board for the whole office to admire. Software may work better, yes, but people don’t see your monitors. 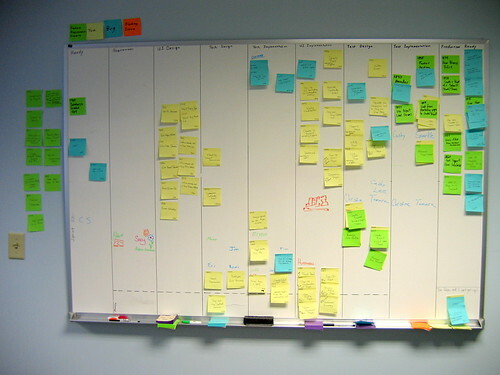 Big boards and colorful post-its, are not only retro, but they give your team the visibility it craves so much, as well as brightening up an otherwise drab room. 3) Make sure it has a stand up meeting. Stand up meetings just exude agility. Inspecting the troops daily sends a huge chill up the spine of most managers as well. This helps get buy in from management (an important consideration). 4) Make sure you use plenty of references to Japan, Toyota, and as many japanese words as possible. Korean and Chinese words won’t do. They must be Japanese for your new methodology to be successful. It doesn’t matter how much your methodology is based on any real Japanese method, just the mere claim that it has roots in Japan is enough to get the hipsters on board hook line and sinker. 5) Rename common things (meetings, billboards, stickies) to new and exciting names for the same thing. If you tell your boss you want to put stickies on a billboard, he’ll yawn at you. If you tell him you’re setting up a kanban as an information radiator, you’ll be next in line for promotion. If you tell your team you want a daily meeting, they’ll hate you. Call it anything else (scrum, retrospective, kaigi, planning game), and they’ll line up as a herd in no time. This mystique and BS angle cannot be overemphasized in terms of the successful uptake of your new methodology. In fact it is the core of your new methodology, and “unique” differentiation from everyone else. If you build a new mousetrap, noone will care. If you call it a Nezumi-tori they’ll sell by the shipload. 6) It’s important to have a “master” or equivalent. Master is good because so many vague callings, like Reiki, and crystal healing, still have “masters”. Of course there is a Japanese word for master — “sensei” — but nearly everyone has heard that word and it isn’t impressive. Sure, Master sounds almost as corny but not as blatantly pandering. Be creative here. Try to think of something new! 7) Remember, you’re not selling a methodology here. You’re changing the world. Make as many references to empowerment, change, saving the whales, whatever, that makes it seem like you’re not really selling the same old thing for 3x the price in a blatant attempt to just make a buck. 8) Use #7 and #4 to harness the power of aging boomer era radicals. Not only do these people have a lot of time on their hands to go out and proselytize your new methodology on blogs, conferences and related, but protesting and grassroots campaigns are in their DNA. They were protesting at college, burning bras, and fighting against the man — harness these minions to proselytize your new methodology. Get them on your side by talking about personal empowerment, fighting the man, and that your methodology is the newest cool thing with the tasty asian flavor. 9) Demonize the opposition for not using your methodology; after all, how could they be, since you just invented it. Use FUD to promise that anyone who doesn’t follow you will fail. Keep in mind that there is scant to no evidence that any other methodology is all that successful, so don’t feel you need to provide any evidence either. Plenty of people take various methodologies on faith — they can do the same for yours. Now that you know what to do, use these proven steps and have fun creating a new methodology, promoting it, and certifying people in it. It’s the wild west out there, so go grab a bucket to catch the money raining into pop methodologies these days. This entry was posted in Uncategorized and tagged #cartel, #kanbanvsscrum, #scrumvskanban, agile, funny, humor, kanban, lean, scrum, tps, waterfall, xp. Bookmark the permalink. PS. is MethodoLOLOgy instead of Methodology just a type or am I missing the joke? Arialdo, did you accidentally tweet this with the #scum hashtag or was that on purpose? Am I the only who thought the mouse picture extremely funny! Is that from a movie? I don’t think it is from a movie— although it is alluding to the scene with Tom Cruise hanging from ropes in one of the Mission Impossible series. 2 of the photos (The “big board” and the “Master”) are stills from movies, the mouse just alludes to a movie.